Mozilla WebRunner, a stripped down version of Firefox with no tabs or URL bar. And now WebRunner’s all grown up and has a new name Prism.Mozilla has outlined their goals for the simple web browser, to let you access web applications without firing up Firefox, Internet Explorer, Safari. 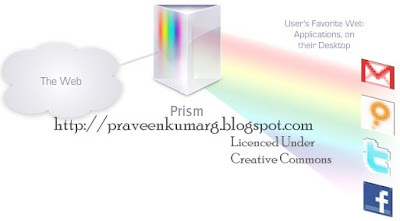 You download and install Prism. The first time you run it, a window will pop up asking you for a URL, name, and where you’d like to “install” the application. It is Basic Installion Procedures Only. Prism doesn’t feature all the bells, whistles, toolbars, and add-ons of Firefox, it’s a very light weight browser. And if you just want to access Google Reader, Gmail, or Zoho, that might be enough. Eventually, Mozilla may integrate Prism with Firefox. In other words, there would be a toolbar menu that says “make this a desktop app”. Any time you visit a website that you want to open with Prism in the future, you could click a button to activate the Prism settings menu. “bash: ./prism: No such file or directory” error on 64-bit Linux (Ubuntu Gutsy Gibbon) occurs if you do not have the “ia32-libs” package installed. Installing the package with “sudo aptitude install ia32-libs” resolves the issue.